Bedsores are a real risk for anyone bed bound patient with low mobility levels, so a suitable pressure relief mattress should always be used to mitigate this. The Sidhil Trio II Dynamic Mattress System provides excellent pressure distribution with 22 cells to provide better support for lower weight patients, and includes static head and heel cells to support these sensitive areas. 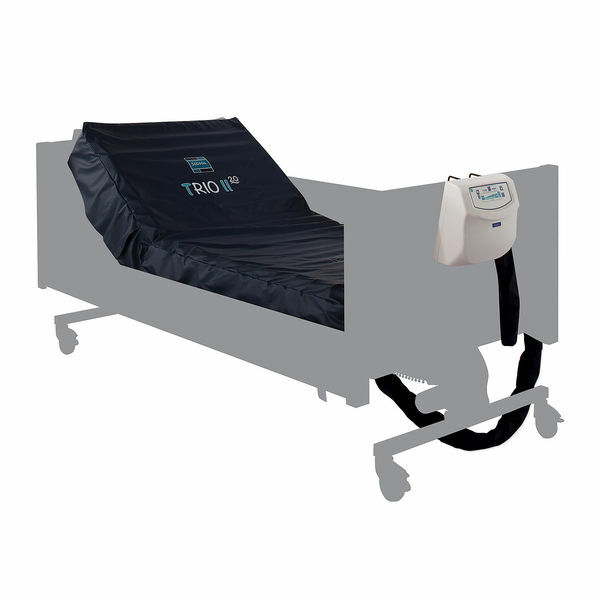 Operating with three cell dynamic pressure therapy, this full mattress replacement system is suitable for those at high risk of pressure sore development. This advanced mattress is made with 22 cells, with a three cell alternating dynamic pressure system on 12 minute cycles. This system allows the mattress to provide excellent dynamic pressure care, while static head cells and narrow heel cells provide added stability and pressure care. Some mattresses with fewer, larger cells can be unsuitable for smaller or lighter patients, as the cells will be slightly less able to adapt to small changes in position. This mattress is able to accommodate patients with lower weights, as it incorporates 22 cells that can adapt to smaller pressure changes. This mattress is easy to control with an easy-to-use digital control system to manipulate both static and alternating modes. A unique 'Nurse Mode' allows carers to raise the pressure of the mattress to its highest setting for 20 minutes, allowing nursing procedures to be carried out in a safe and stable manner. This system includes a number of features to ensure the user's safety, including audible and visual alarms to alert carers of pressure loss, power loss or alternating failure. CPR systems are also included, and transport is facilitated by a 'blanking plate' that keeps the mattress inflated throughout transfers. Please be advised that the Sidhil Trio II Alternating Air Pressure Relief Mattress System is usually delivered within 1 week of your order being placed. We would advise you to consider this delivery estimation before placing your order. For more information, please contact our Customer Care Team at 020 7501 0592.